The colors and textures we see every day often reflect and inspire our wardrobe. Living in New York you can easily get caught up in the somber color variations of grey streets and marble office buildings. Sometimes you can go a whole season duplicating the different shades of grey in various shapes, sizes and textures. We aren't opposed to the color, but sometimes it's nice to reawaken any color of the rainbow. 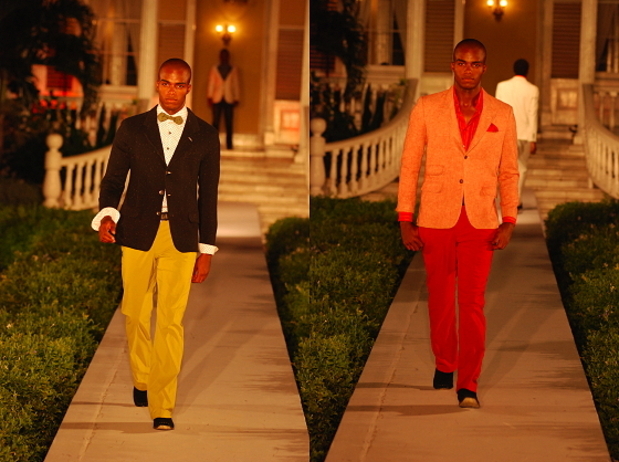 Saint International's Style Week in Jamaica is a good place to do just that. 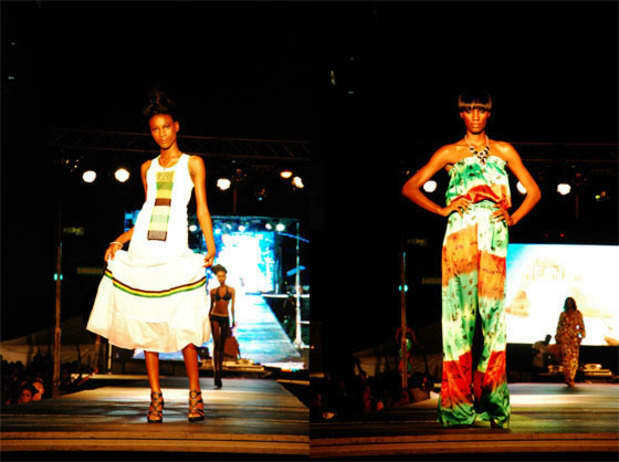 Every year the colorful lushness of Jamaica's scenery and culture is reflected on a few dozen spidery long-legged models donning the brilliant patterns and colors of designer creations. This year Style Week kept our snap happy fingers especially busy as we navigated through the sweltering thick humidity of Kingston on a quest to snap some chromatic creations. 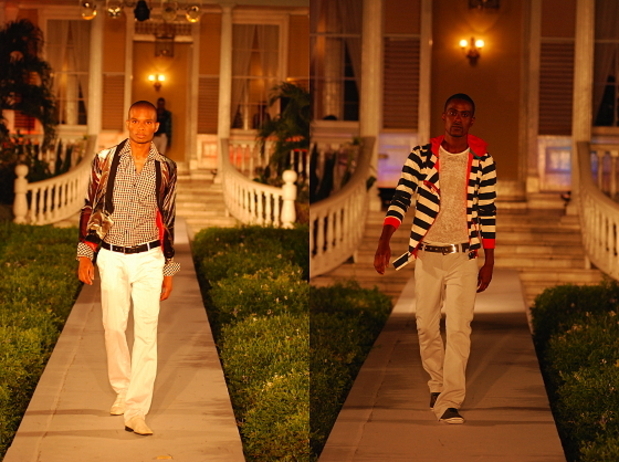 The event began Friday evening with the men's collection being showcased on the front lawn of Devon House, the 19th century heritage site dedicated to the home of Jamaica's first black millionaire, George Stiebel. While designer Les Campbell retained some of this austerity in his finely manicured, mature collection of suits, Spokes Apparel took a different spin on the classic suit using rich colors of green, blush and mauve in classically tailored ways. A new comer to the Jamaican fashion scene, Richie Drenz of Drenz Fashions showcased a more casual look with striped hoodies, flat front slacks and tailored button downs. And traditionalist Shades of Africa gave a new twist to African textiles with printed pants and African Dashiki-style shirts. The woman's collection was shown the following night at Fort Charles, another heritage site located on the peninsula of the once-upon-a-time pirate run Port Royal. But it was on Sunday that we finally caught up with all the collections and designers at the closing event. 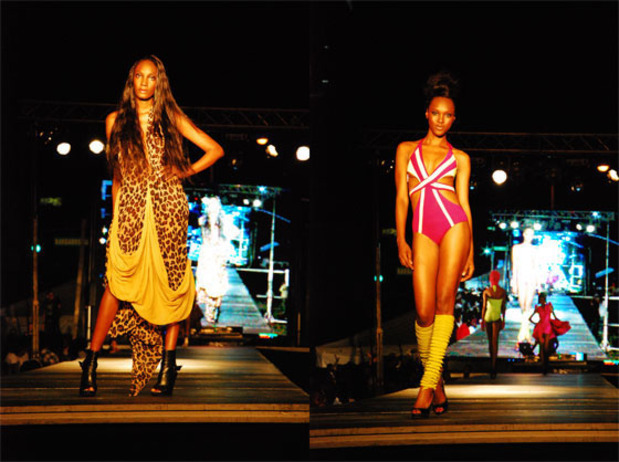 It was Style Week's yearly tradition of a holding a runway show in the middle of Knutsford Boulevard, appropriately called "Fashion Block," that had young and old flocking to New Kingston from all over the city. The three hour event featured over twenty designers, from locals to the locally loved New York celebrity stylist, Indashio. There was an eclectic array of looks, from the white fiesta dresses of Paul Burgess to the dancehall-queen-friendly polka dot jumpsuit of TK By Kenya. Fashion Block veteran Dexter Pottinger showed his bubblegum humor in a fanciful pink and white swimsuit with lime green leg warmers while another veteran, designer Neah Lis, did a fabulous range of sleeveless, wide-legged jumpsuits painted in broad strokes of greens, reds and blues. Designer Donna Shamir did a swimwear collection of perfectly placed suits in summer tones while Indashio closed out the show with an impressive diversity in texture and pallatte. A particular favorite of ours being his draping leopard print dress with a beige underbelly. The shows end left us with a little more lightness in our step and a new barrage of color and texture bubbling in our heads. Eager to reflect that inspiration, we returned home to our closets with an added sense of playfulness.